PopCap and EA have joined forces to merge Plants vs. Zombies into a third-person shooter mold, introducing it to the world of 3D (thanks in no small part to the Frostbite 3 engine), and to a genre beyond tower defense: third-person tower defense. We talked about it just before its official release, and have returned with a little more to say about it as a full game. The nagging question that Plants vs. Zombies: Garden Warfare poses is who exactly it’s made for. Casual gamers (presumably the easy crowd who played the original PvZ games) are an obvious target, but the appeal of a budget-priced multiplayer shooter doesn’t suggest a particular niche outside of people with nothing else to do on their Xbox One, or the kid in Best Buy who recognizes that thing he plays on his parents’ iPad happens to have a game on the Xbox 360. I guess that’s also a wide net to cast, in a way. Whatever the case may be, it’s a fun enough game for just running around and shooting up the place with a bunch of other people. The box claims that you can play certain modes solo, but who doesn’t have the internet these days? Whoever they are, they aren’t reading this review, whereupon they would have learned that without access to the internet, Garden Warfare is a fart in the wind. Its design is focused entirely around the mayhem created by at least five other people in a match would naturally produce. I’m not just making that up, either. As noted in our preview, it was created originally as a shooter, whereupon the game later inherited its tower defense roots for modes such as Garden Ops to add a little more substance. It’s too bad the game isn’t confident enough to omit the option for solo play, opting instead for an embarrassing show of how bland it can be without company. The character animations and attention to detail are Garden Warfare’s instant attraction, as the characters manage to charm in doing so little as idling in the selection screen. The same can be said for the visuals in most maps, complimented by thematic diversity ranging from verdant hills to some cool jack-o-lanterns. It’s certainly a departure from most shooter’s gritty, and the candy shell coating on this otherwise typical shooter serves as some necessary panache. “Typical” in this case, being an inoffensive set of mechanics; they’ve been playtested, optimized, and tuned to a point that they’re neither exhilarating nor necessarily boring. They just work, and that’s all they need to do. You might almost think the wow factor is hidden somewhere else, like in its presentation. Some interesting ideas are kicked around, such as how encouraged player revival is. Reviving a downed player will retract a kill from the enemies’, which adds a risk/reward hook for saving friendlies in dangerous situations. Leveling up your character will occasionally see this implemented as a “revive ___ players” goal, popping up frequently enough to keep it in the forefront of players’ minds. And then there are the less interesting ideas, whereupon the game’s charisma has trapped underneath it an XP-based reward system that will eventually cap people off on levels and fragment the player base in common modes with overpowered abilities and special characters. Little is left to the imagination as to how this game will play out for people: gain enough XP to open abilities in a class you like, max out that class (unlocking special characters along the way), and hit a ceiling where your options are to rinse-and-repeat with a new class, or stick with your extravagant piranha plant that now looks like it found its way into Braveheart. What’s a casual shooter anyway? Is there such a thing in a competitive game? I’ve ever heard of anyone winding down by competing with maniacs online in the likes of Halo or Call of Duty, at least. I’d wager that if the goal is to make a third-person shooter more casual, then it’s either in accessibility or in a neutral approach to competition. Maybe it’s the co-op stuff in Garden Ops. Maybe it’s indifference, or a casual interest in shooting. If that’s the case, then Garden Warfare is a really casual game—perhaps too casual. Many times I’d notice myself passively playing a round while lapsing into existential crisis just after overtaking a garden plot, or waiting for a special power’s cooldown. Meanwhile, the game is delirious in its antics, and I’m wondering how many kills I’ll need until I can buy another Sticker Pack or my dog needs to be fed. Does my dog even know it’s alive? He seems happy enough, so probably not. 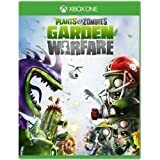 At the end of the day, Plants vs. Zombies: Garden Warfare delivers on all its promises: it’s loony, hugely accessible, and has plants and zombies locked in warfare. Mystery solved; you get what you pay for. Whether it’s for you is a different matter. What void it will fill in a universe full of adequate shooters is only defined by your taste, or whether you’re looking for games to pad out your Xbox One library. On the other hand, there are a lot of accessories and crap to outfit characters with, if you like that stuff.